V50 Schedule will be posted in late May. Forklifts will be available on the above dates for truck deliveries, if needed between the hours of 7:30 am to 11:45 am and 1 Pm to 3:30 pm only. Please remember that if you are shipping cargo with us from Honolulu, you must pay for shipping when you drop your freight off with us. We can not ship without payment. If you don't pay, we will contact you to have you pick up your cargo before we sail. Also please make sure that all your items are listed on your dock receipt BEFORE you leave your freight with us. It is your responsibility to make sure everything you are shipping with us is noted on the receipt. We will not accept any claims for non delivery, if your cargo is not listed on your receipt. Thank you. We accept cash, checks and Paypal (if you have an account). There is an additional 3% charge for Paypal charges. For Paypal charges please contact Wendy Andrews (KWAI office) at 808 854-6289 during normal business hours. We will have very limited amount of space to accept cargo at our new warehouse in Honolulu. Please contact Jennifer Schiefla if you need to make arrangements to store your cargo. Her mobile # is (808) 782-5271. Please contact us should you have any questions about the schedule. All listed dates for Kiribati are USA +1 day according to their calendar. Please see our new online order policies in "How to Ship Cargo" on this website. Thank you very much, Tiabo moa, Meitaki maata. The main goal of this project is voyaging on the high seas. The present service is a packet vessel between Hawaii and the Cook Islands which offers excellent year round sailing across the trade winds in both directions. Adventure travelers and crew immerse themselves in a life at sea, sharing the opportunity to learn seamanship, navigation, rigging and ship and small boat handling. A round trip schedule of two to three months will allow for half the time at sea and half the time in port or at anchor. The ocean passages are memorable, but so are the relaxed stops at very remote islands. A powerful sailing ship, driven in part by the free energy of the wind, dependent only on nature and the resources she carries aboard is not only a work of art and beauty, she is a proven, economical vehicle of transportation where fuel is expensive and often scarce. Our sails are our subsidy, while the ship rides the waves in the timeless tradition of her pedigree. For centuries these islands were supplied by infrequent ships arriving to sell their cargoes to the local inhabitants. Even in these modern times many of the small islands on our route are still not supplied on a regular basis. With approval and support from the local governments and island councils we provide a comprehensive service. We deliver ordered cargoes from the least expensive sources in Hawaii, and charge a purchasing fee and freight on all goods. Within the Line and Cook Islands we carry local cargoes out bound from Christmas Island or Rarotonga and return with copra, frozen fish, and other island products and carry up to 60 passengers on deck under a big awning tent. In our original plan adventure travel figured prominently. As the business grew it became clear that local island transport of local island passengers was far more important. This market remains an undeveloped opportunity. We offer a unique chance to visit remote islands, most accessible only by ocean voyages. On our vessel, passengers are be able to witness and take part in historical sea travel and trading. Long term, rewarding relationships have been established with the island communities and our passengers will be happy to meet the locals and able to pay for guided fishing, snorkeling, or exploring trips. In the age old island style, bountiful luaus ashore and lively parties aboard will be inevitable. We appeal to the eco-tourist as well as sail power is an environment-friendly way to see the world. The Pacific Islands will continue to offer risk-free destinations where political turmoil can be left behind. We make 3-4 trips per year between Hawaii and the Cook Islands with time available for expedition charters in the Pacific area. Her cargo hold and strong cargo gear will allow her to hire out for dive, salvage, scientific or movie charters. Her sails can carry her cheaply to remote spots wherever work is found. We have carried ham radio operators to the uninhabited remote Southern Kiribati Islands and ecologists to Malden Island to research feral cat extermination. The Phoenix Islands, home to the largest marine sanctuary on the planet is within our range. 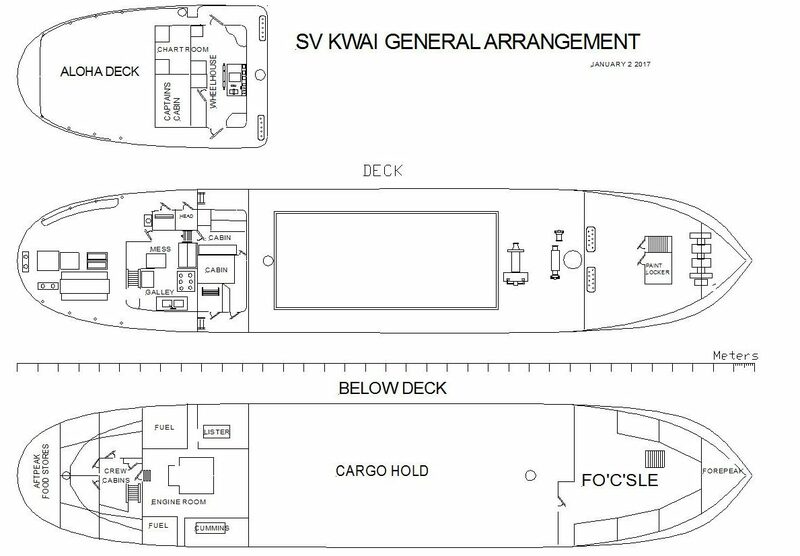 Island Ventures Ltd, a Cook Islands registered company owns and operates the SV Kwai. In 2016, the full refit of the ship as a sailng vessel was completed with the addition of the mizzen mast, sails and the Aloha Deck, stretching from the wheelhouse to the stern of the vessel. The return voyage from Fiji to Hawaii, 3300 mile to windward with an average speed of 6.5 knots has shown the improved sailing ability of the ship and the further fuel savings are clear. The ship and the business have reached maturity. Their development have taken 10 years longer than planned but within the original budget. The refit has all been accomplished by our own crew and the tools and know-how remain valuable assets. With the major refit behind us now, the full benefits of the sailing rig and our strong business network throughout the Central Pacific bode well for success over the next few years. In the mean time, Kwai has expanded her role in the Line Islands and kept up her trade in the Cook Islands. After the disaster of exchange rates in 2008 when the New Zealand and Australian dollars lost half of their values, we are now back on track as serious suppliers of foodstuffs, construction materials, solar energy products and electronic goods to our list of islands. The Kiribati government has given us a license to carry passengers and cargo between the Line Islands of Christmas, Fanning and Washington Islands. We have brought two loads of dried seaweed from Fanning to Honolulu to tranship to China. Kwai offers a fine vessel to service these islands and we continue a strong relationship with the federal and local governments and the island peoples. The ship is welcome every where and we love to be there. The enthusiastic response from all the islands we visit has been wonderful. The business has gone very well with few claims and 100% payment of freight. The islanders love having a new ship and we always stay a few days to enjoy their specks of paradise. We intend to build on this community of friends to support our voyages, offering a unique adventure for crew and passengers. 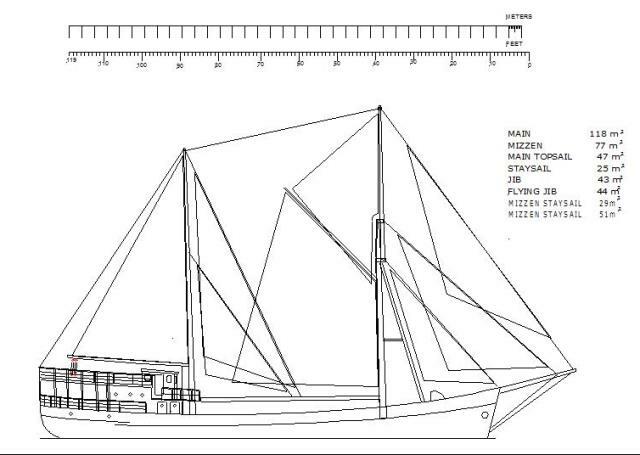 Over the next year we seek to raise $350,000 to fund this last part of the conversion of Kwai to a full sailing vessel. Investors will receive shares of the Cook Islands registered company, Island Ventures Ltd, and on the same basis as the holders of shares from the current investment totaling $645,000 in cash and “sweat equity”. Return on new investment will be realized much more quickly than our current patient investors, but all shares and accompanying benefits and privileges will be the same. From the start we have sought investors who will participate actively in the venture. Financially we turned a profit in 2007 and again in 2009, after losses in 2008, with cargo and trading operations. The direct operating costs are about $600/day, and we took in $1000/day in 2009, enough to cover long term costs. We will add $800/ day in passenger revenues once the refit is finished, more than doubling our gross income. Additional savings will come in fuel costs as we will sail up to 90% of the time with a full rig. Operational expenses will increase as we raise crew pay and hire an office manager ashore, but we still look to operate at a minimum net profit of $500/day for 250 days a year. This will yield an annual return on investment of 15-20%. The capital value of the vessel as a full sailing ship in a profitable and unique business should be considerably more than the total investment. Further details are available upon request. 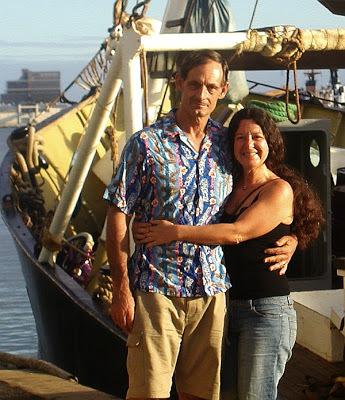 Captain Brad Ives is the President of Island Ventures Ltd and the Senior Captain of the S/V KWAI . He has 25 years experience in traditional sailing and commercial seafaring. KWAI is his third project converting an old ship to a sailing ship. In the 1970’s he was the captain and part owner of the SOFIA, a 90’ Baltic Trader converted to world voyaging. She carried cargo in the West Indies and later trade goods, from sugar to ebony elephants, through the Pacific and Indian Oceans. 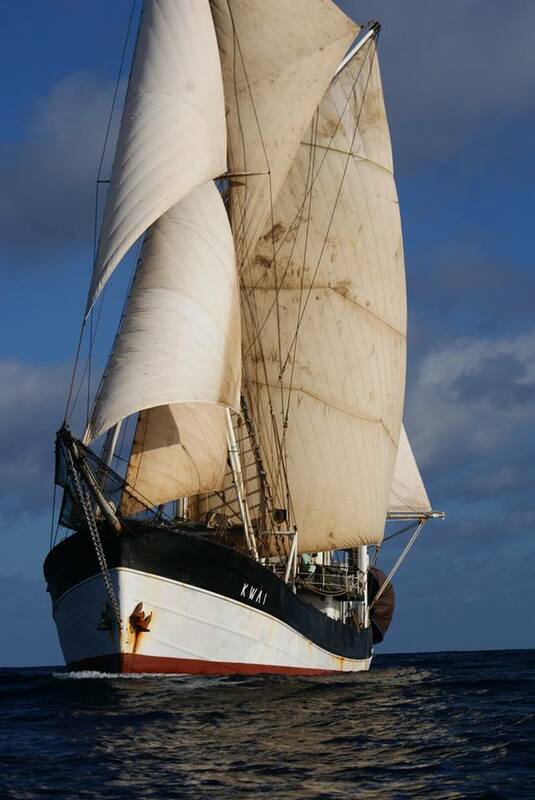 In 1978 he purchased the EDNA, a 100’ ex fishing vessel in Denmark, refitted her in Portugal, and operated her as a sailing cargo vessel for 9 years, trading mostly in construction materials. Tropical timbers for boat building became her specialty and Brad continues to supply these to boat builders throughout the US. In 1978 he earned the US Coast Guard Master of Sail License for up to 300 gross tons, now upgraded to 500 tons. Under his command SOFIA sailed around the world and EDNA made 3 Atlantic and 8 Pacific crossings. Brad has extensive experience building boats as well, installing engine, electrical, plumbing and navigational systems aboard the yachts built at Gannon & Benjamin Boatyard on Martha’s Vineyard. He is uniquely qualified to undertake the conversion of KWAI and to direct the trading and sailing operations throughout the Pacific. Island Ventures Limited will hire a full time captain when the ship is operating and Brad will serve as general manager and relief skipper. April Fountain or Mama Kwai, is Brad’s wife and Manages the office in Hawaii as well as being the Ships Agent. She brings many years of successful business experience in both her own and other businesses. She has done 3 ocean crossings as the head cook aboard the KWAI and sailed on numerous sailing ships around the world.